This is roughly the same as Figure 2.3 in Hello, Android, although I corrected a bug and added the dashed lines for <<kill>>. 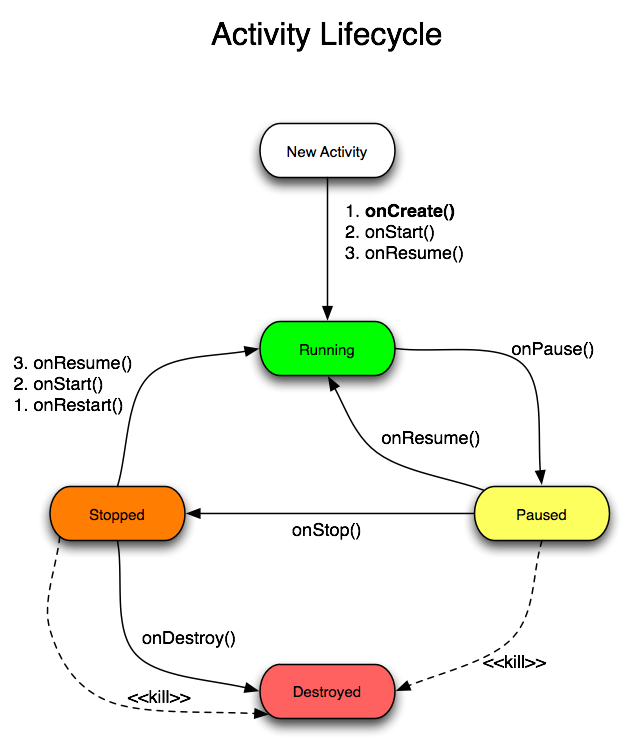 Those indicate the OS may kill the Activity when resources are low, so onStop() and/or onDestroy() might not be called. I’m going to use this as a handout when I talk at next month’s OCI Java Lunch. Called after onStart() when the current activity is being re-displayed to the user (the user has navigated back to it). Based on that, I think it is clear that onRestart() is always followed by onStart(). Figure 2.3 on page 30 of the new Hello, Android book seems to be based on the misleading comment, because that figure shows onStart() and onRestart() reversed. I submitted the errata here, so I suspect it will be fixed before the paper book is printed. Now you know how I spend my Saturday nights! Posted on Saturday, November 1st, 2008 at 8:15 pm in Android.